What Is Data Planet Statistical Datasets? Data Planet Statistical Datasets is a web-based research solutions tool that provides fast and easy access to data from licensed and public domain datasets within an easy-to-use interface. With this dynamic tool, you can scan the contents of the collection, select subjects and variables of interest, and view your data in side-by-side tables and charts. The Data Planet repository contains more than 52 billion data points from 6.2 billion datasets sourced from 75+ source organizations. There are billions of charts, maps, views, rankings, time series and tables available for use in the Data Planet repository. All of the data have been standardized and structured, and are described with up to 37 fields of metadata, including a controlled vocabulary. Statistical Datasets has a basic module and several premium datasets.Click here for a listing of datasets and sources available in the repository. What Datasets Are Included in Data Planet Statistical Datasets? To check which datasets are included in Data Planet Statistical Datasets, or to see if your institution subscribes to any premium datasets, go into Statistical Datasets and look at the Indicator column along the left. If you subscribe, you'll see the premium datasets listed, along with all available datasets in the indicator tree on the left-hand side of the screen. 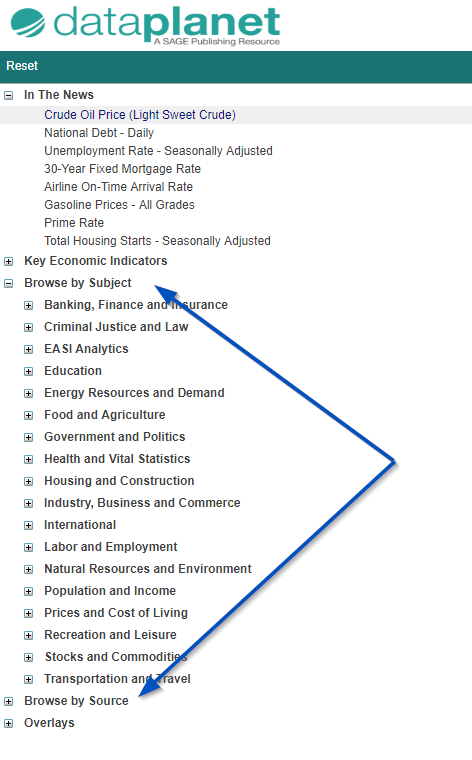 Datasets and indicators may be browsed by broad subject category and by source. For a full listing of datasets available in Data Planet Statistical Datasets, and the sources of these datasets, see Data Planet Datasets and Sources. The Datasets display is divided into three panels. A short mnenomic for this is I-C-Results, or Indicator, Criteria, Results. First, select the data from the indicator panel. Once the indicator is selected, the criteria panel will change to reflect the options available for that indicator. Second, select the criteria you are interested in. Third, use the tool bar (between the criteria panel and the results panel) to customize your results by selecting/deselecting criteria to be charted and displayed. Results can also be viewed as a map, chart, or graph. You also see a Search box above the criteria panel - more on that in Finding Data. What happened here is a feature that allows a quick Yahoo search to find out what happened. Users may double click on a point in a trend chart and call up news stories that discuss those statistics. This example shows a click on 1981 in the Prime Rate dataset. The search box can be edited if the user would like to search for different, or additional, text.